The former assistant director of the library Qusai All Faraj said that the Mosul Public Library was established in 1921, the same year that saw the birth of the modern Iraq. Among its lost collections were manuscripts from the eighteenth century, Syriac books printed in Iraq's first printing house in the nineteenth century, books from the Ottoman era, Iraqi newspapers from the early twentieth century and some old antiques like an astrolabe and sand glass used by ancient Arabs. The library had hosted the personal libraries of more than 100 notable families from Mosul over the last century. During the US led invasion of Iraq in 2003, the library was looted and destroyed by mobs. However, the people living nearby managed to save most of its collections and rich families bought back the stolen books and they were returned to the library, All Faraj added. “900 years ago, the books of the Arab philosopher Averroes were collected before his eyes...and burned. One of his students started crying while witnessing the burning. Averroes told him... the ideas have wings...but I cry today over our situation,” said Rayan al-Hadidi, an activist and a blogger from Mosul. Al-Hadidi said that a state of anger and sorrow are dominating Mosul now. Even the library's website was suspended. “What a pity! We used to go to the library in the 1970s. It was one of the greatest landmarks of Mosul. I still remember the special pieces of paper where the books’ names were listed alphabetically,” said Akil Kata who left Mosul to exile years ago. On the same day the library was destroyed, ISIS abolished another old church in Mosul: the church of Mary the Virgin. The Mosul University Theater was burned as well, according to eyewitnesses. 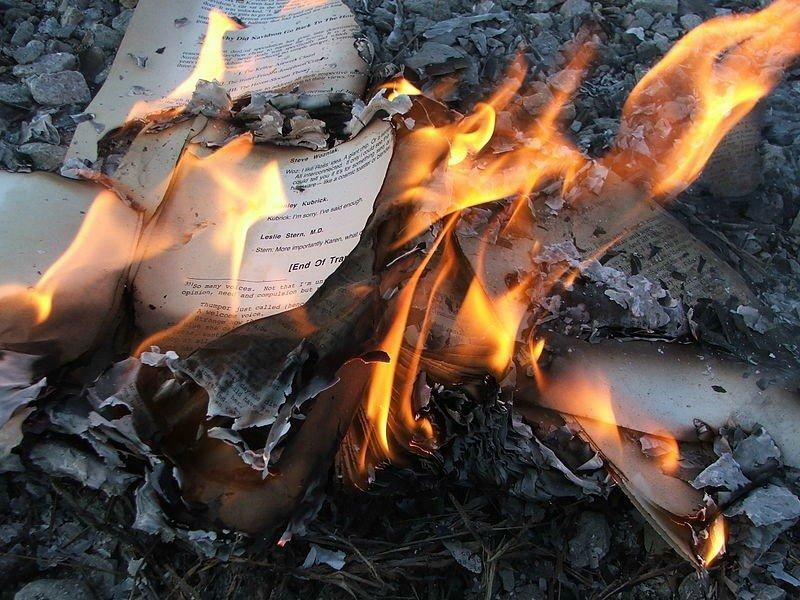 In al-Anbar province, Western Iraq, the ISIS campaign of burning books has managed to destroy 100,000 titles, according to local officials. Last December, ISIS burned Mosul University’s central library. Iraq, the cradle of civilization, the birthplace of agriculture and writing and the home of the Sumerian, Akkadian, Assyrian, Babylonian and Arab civilizations had never witnessed such an assault on its rich cultural heritage since the Mongol era in the Middle Ages. Last week, a debate in Washington and Baghdad became heated over when, how and who will liberate Mosul. A plan was announced to liberate the city in April or May by more than 20,000 US trained Iraqi soldiers. Either way, and supposing everything will go well and ISIS will be defeated easily which is never the case in reality, that means the people of Mosul will still have to wait for another two to three months. Until then, Mosul will probably have not a single sign of its rich history left standing.